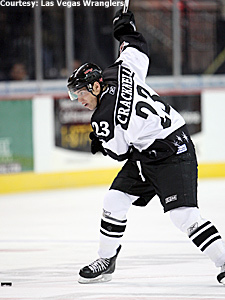 Adam Cracknell compiled 29 goals and 30 assists in 61 regular-season games for the Wranglers this past season. Knowing full well the second year of his professional career would be vital for his development, Las Vegas Wranglers forward Adam Cracknell stepped up his game in a big way. A ninth-round pick of the Calgary Flames in 2004, Cracknell had a breakout season in Las Vegas in 2007-08, compiling 29 goals and 30 assists in 61 regular-season games. But the 22-year-old right wing was far from done. With his franchise in desperate need of avoiding another early exit in the Kelly Cup Playoffs, Cracknell helped the Wranglers reach the final round of the postseason with nine goals and 13 assists in 21 games. Indeed, it was a tremendous sophomore campaign for Cracknell, who scored just 11 goals between the regular season and the playoffs as a rookie in 2006-07. So what was the biggest difference? Cracknell was just one of Calgary’s prospects to flourish in Las Vegas this season. Power forward Ryan Donally – who missed the final three rounds of the playoffs due to injury – scored 15 goals and had 176 penalty minutes in 53 games. Las Vegas coach Glen Gulutzan was pleased with Cracknell’s progress this season and said members of the Flames’ organization traveled to Sin City to see the progression of their prospects first-hand. Las Vegas certainly enjoyed a better postseason than in years past. Under Gulutzan’s guidance, the Wranglers notched at least 100 points in the standings for the third-straight season. But Gulutzan’s club was unable to get past the second round in his first two years behind the bench. That all changed in 2008, as Las Vegas fell just two wins shy of a Kelly Cup. Cracknell concurred. From an individual standpoint, the Prince Albert, Saskatoon, native is hopeful that his strong performance in 2007-08 will lead to an opportunity to play for Calgary’s American Hockey League affiliate in Quad City next season. Cracknell had a brief promotion to the AHL this season, scoring once in four contests. Knowing that the game seems to be faster with each passing season, Cracknell knows what he has to work on this offseason if he hopes to get more of a crack at the Triple-A level in 2008-09. Gulutzan’s main focus will be to re-tool his roster for another long playoff run next year. With AHL coaching jobs few and far between, Gulutzan may have no choice but to return to Las Vegas, where he’ll aim for his fourth straight 100-point campaign. Considering that his franchise has become a premier place to play at the ECHL level, it’s conceivable that Las Vegas could once again finish atop the Pacific Division standings next season. Selling points are always nice – especially since the bottom teams had a two-month head start on coaches such as Gulutzan and Cincinnati’s Chuck Weber in the recruiting process. Then again, those coaches probably would have been happy with the opportunity to coach in the Kelly Cup Finals. Around the ECHL -- The Victoria Salmon Kings acquired defenseman Taylor Christie from the Phoenix Roadrunners on Monday to complete the Dec. 5, 2007 deal that sent defenseman Bryan Nathe to Phoenix. The Roadrunners also sent defenseman Gerard Miller to Las Vegas to complete the Sean O’Connor deal from last September. ... The Fresno Falcons sent goaltender Kris Mayotte to the Pensacola Ice Pilots on Tuesday to complete the Feb. 26 deal that involved forward Spencer Carbery. ... The Florida Everblades signed defenseman Kyle Peto. ... 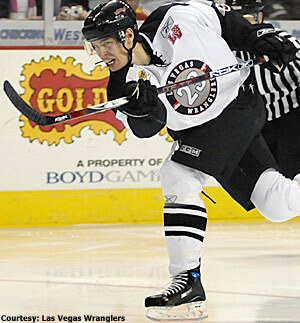 The Stockton Thunder re-signed left wing Tom Zanoski, who had 12 goals and 20 assists in 42 games in 2007-08. ... The Gwinnett Gladiators were the recipients of the league’s Award of Excellence, which is given to the organization that is first-rate, excels in all categories of sales and marketing, and distinguishes themselves in their community, both on and off the ice. ... The Bakersfield Condors signed centers Dave Bonk and Dan Rudisuela.